I ran into this painting while I was visiting the exhibition about Paris. Various artists were inspired by the romance of this city and HAM brought it together for people to see. The circus was part of that as well. Smartly placed on a red background this panting popped out nicely. The painting’s colours get strengthened by the choice of this background. What also catches attention is the hidden symmetry in the painting. The circus tent is exactly in the middle even though you don’t see it fully. The horses are more obvious when it comes to symmetry but have you also noticed that there are two dogs? Sure, not the same kind of dog but both face the big muscle guy in the middle. The sneaky clown that lurks in the background is one of those elements that makes me smile because nowadays so many people appear to be afraid of clowns. I personally adore that and did some art around clowns myself. Also, I have another project surrounding clowns in my files that just needs the right timing to get out there. Regardless of what you think about circus, clowns or the use of animals, the clown in this painting is making a major impression. 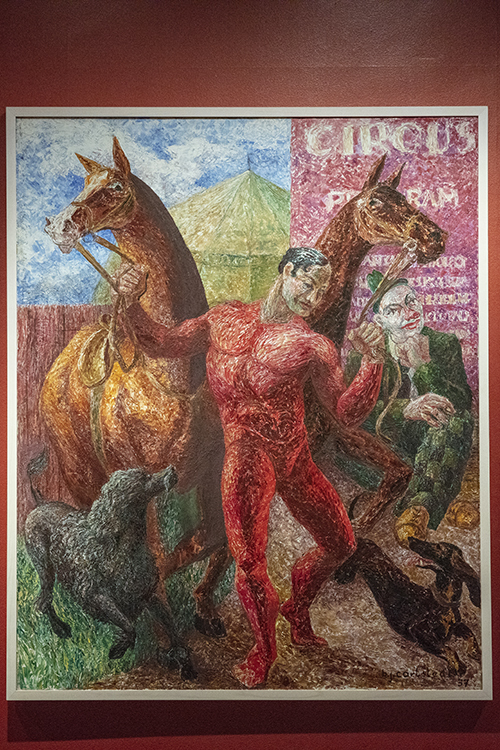 Without it there is not that strong reference to the circus so it is a key element to the painting. The last part that makes this painting perfect is surprisingly not the painting itself but its frame. The choice of color makes it look like we are dealing with a poster that tells you the circus has arrived in town, which is a whole different purpose than a painting.